I was half-dead from the waterfall and street cleaning-drive we had carried out as a group that morning. By the time we finished, it was well past noon and the sun had managed to wear me out. It always does. With a heartbeat-rate signifying extreme exhaustion, I sat in the car that was supposed to drive the group to Shringa Rishi temple. In the Himalayas, even if some thing is not half as good you had dreamt it to be, it is likely to be thousand times better than what you had imagined. (If you don’t trust me on this, feel free to go through this archive). Chaini Kothi, or Chehni Kothi as it is locally known in Kullu, happened to us on a tightly packed day. It didn’t help that I had reserved the evening for my daily run for #100DaysOfRunning. After watching others plan the hike and wracking my brain a bit, I arrived at the conclusion that I will have to marry my evening run with this hike. The trek starts from Shringa Rishi Temple, which is located at a distance of 8 kilometers from Banjar bus stand and takes about 35 minutes. Just to put things into perspective, it is a hike of 161 meters in the distance of 800 meters (at least that is what my Strava reading said). In case this is Greek to you and/or you are new to hiking, please take it slow. The hike to the top passes through some of the most beautiful orchards of peaches and apples. Take your time to relish the sight. Once you reach atop the hike, suddenly all of it will seem worth it. The sight of two towers with a backdrop of mountains is overwhelming! Chaini Kothi is the main tower and is known to house a temple. It is not open to the visitors. It is said that in the earlier days, it was used as a fort. Those stairs lead to the middle of nowhere and are fairly scary. The staircase leading to the temple door is made of a single log of wood and could easily be removed in a ‘move of defense’ if the need arose. A case of ‘take stairs in case of fire’; quite literally! Dev Bhandar, or the temple treasure, is another tall structure which is right across Chehni Kothi. Tourists are not allowed to go inside Dev Bhandar as well. Both of these buildings are nearly 500 years old. The towers are made of layers of stones and wood, lending the structure earthquake-resistance, I am told. 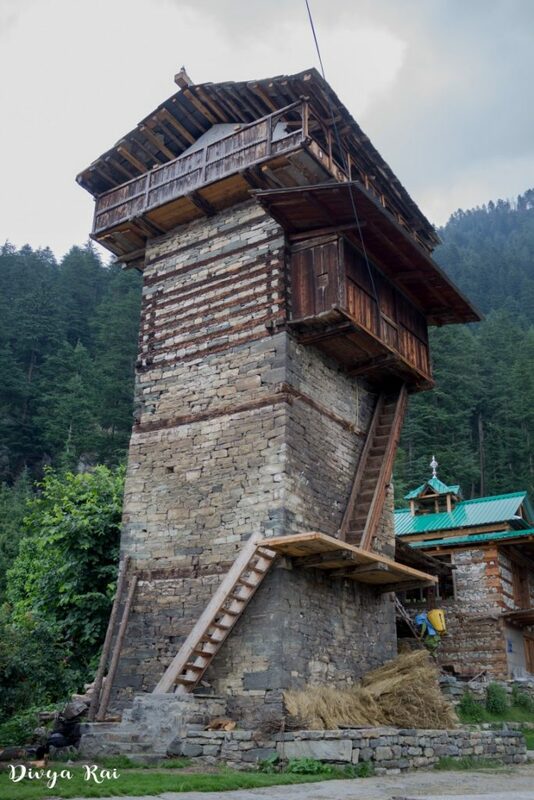 The main tower of Chaini Kothi lost two floors in a massive earthquake in 1905, thereby losing about 30 feet of height. The local folk, who are deemed to be skilled wood-crafters of the village, carried out the restoration project. It is clear that Chaini Kothi and Dev Bhandar have served multiple purposes in the past, based not only on their architecture but location as well. Even though these are known as forts/temple, visually they fit the description of watch-towers better. From the top of the hill, there is a very clear and unobstructed view of the entire valley; makes for a good vantage point if you are a photographer. This is not a difficult hike, the distance is just 800 meters or so. Just remember to wear shoes, and not ‘chappals’ or any fancy footwear. Carry something to munch on if you are likely to go hungry on the way. 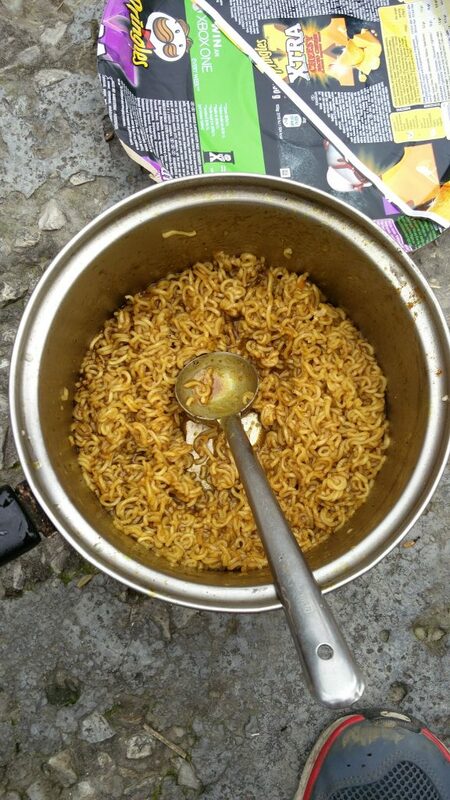 The noodles (Maggi) we had when we reached Chaini Kothi was the worst one of our collective lives! If there will be a competition of terrible Maggi ever, this one will win, hands down. Heart patients are recommended to refrain from taking this hike. It is not advisable to descend in the dark, so please plan accordingly. Avoid going to Chehni Kothi on a rainy day. The wet mud could go slippery. It took us 35 minutes to reach the top. There is no lodging facility up there, so only a day trek is recommended (though camping MIGHT be possible). Chehni Kothi is a part of Kullu district in Himachal Pradesh. 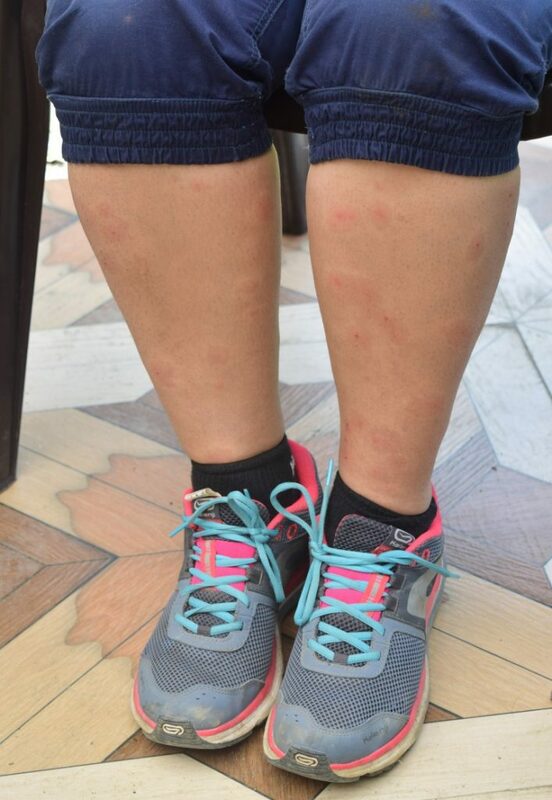 Use Odomos or some other insect repellant, if you don’t want to end up like the pic below (better still, wear something covering your legs): Don’t get too scared or worried, yours may not get so bad. I have a terrible case of insect-bite allergy; even a harmless bite can turn into a huge, swollen lump, only to bleed later. You will have to hire a taxi (charges roughly Rs.800 for up and down). There might be buses plying on the route for the local folks. Check from Banjar Bus stand. You can also hitch a hike. This is one of the things to do in Jibhi, while downhill cycling from Jalori Pass to Banjar Market is another one. I went for it in 2013, a week before my Spiti Trip. P.S. I have refrained from writing about historical how-abouts of Chehni Kothi and Shringa Rishi temple, as I do not have the required information from any trusted source. The villagers do narrate stories, but for those stories to be seen as a fact we need validation, which I have not come across. Thanks for this article. I really enjoy. It IS amazing. Thank you.